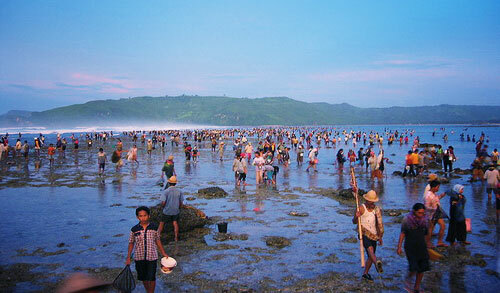 On the 19th day of October in Sasak Calendar-generally February or march-hundreds of Sasak gather on the beach. When night falls, fires a built and the young people sit around competing with each other in rhyming couplets called ‘Pantun’. At dawn the next day, the first Nyale a caught, after which it is time for Sasak teenagers to have fun. In colorful procession boys and girls sail out to sea – in different boats – chase one another with lots of noise and laughter. The worm-like ‘nyale fish’ are eaten raw or grilled, and are believed to have aphrodisiac properties. A good catch is a sign that the rice harvest will also be good.